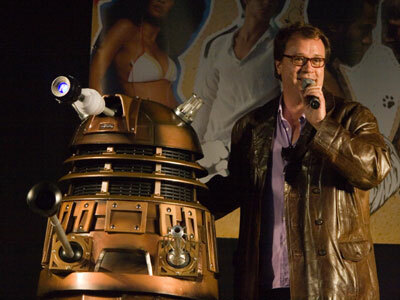 Life, Doctor Who & Combom: Russell T Davies' Personal Dalek is a Star! Russell T Davies' Personal Dalek is a Star! When Steven Moffat said that Asylum Of The Daleks features one of every kind of Dalek from Doctor Who, I didn't think he included personal Daleks as well. "There are Daleks from all era of Doctor Who. Some of them are replicas, some are the originals. And there’s one Dalek from Russell T Davies’ hallway. It’s heavily featured on the poster on the front right." "Russell, before he was even showrunner, was just that cool guy who got a Dalek made for himself so he could have it in the hallway to impress people. But when people ask him is it a real Dalek, he’d say ‘No, it’s not, it’s a replica.’ So when we were doing this, we thought, let’s get Russell’s Dalek, let’s ship it from Manchester and canonise it. Make it a proper Dalek. So in future, he can now say, yes it is." But it didn't return without battle scars from the adventure. Steven later said "It has been returned – with slight scorching – to Russell’s hallway."